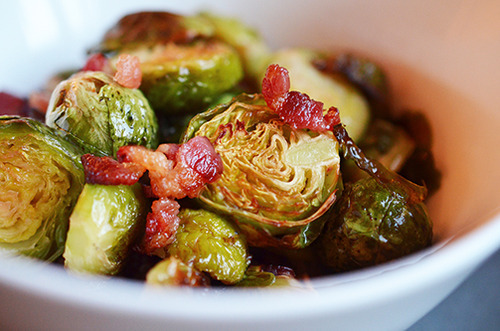 PALEO ROASTED BRUSSELS SPROUTS AND BACON - Underground Fitness Dun Laoghaire | Bray | Dublin & Wicklow - Personal Training, Group Training and Bootcamps. Some ideas for a Paleo Christmas…. Preheat oven to 400°F. Trim the ends and any old outer leaves from the Brussels sprouts. Cut the sprouts in half and toss them with melted coconut oil, salt, and pepper. Dump them on a foil lined baking sheet, making sure to keep everything in one layer. Sprinkle the diced bacon over everything and pop the tray in the oven. The sprouts take about 30 to 35 minutes to roast, so set your timer for 10minutes intervals to regularly rotate and flip the sprouts. Check for seasoning and drizzle some of the aged balsamic vinegar on the finished dish. Bonus: The same technique for roasting these Brussels sprouts also works with cauliflower and broccoli!